Goat milk makes ice cream even more special with its delicious rich taste and extra nutrition (Read more about this in the article, Goat Milk Nutrition Facts. as well as How to Make Ice Cream: Tips for Beginners. Is there any better summertime treat than homemade ice cream? 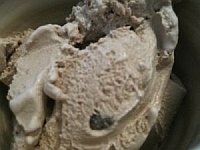 YES--homemade goat milk ice cream! First--Provide your best, mouth-watering description of your ice cream. Third--Include detailed directions for making the ice cream. When finished, carefully read over your directions (or have a friend or family member read them) and ask yourself if the directions are specific and clear enough to be understood by someone who has never made ice cream before. If you need to, add more detail or explanations. Do you have a picture of your fabulous goat milk ice cream to add? Great! Click the button and find it on your computer. Then select it. Articles are updated frequently, so check back here for any new goat milk ice cream recipes!